So where has Thorfinn been hiding for a week? It doesn't make sense that after all that running Thorfinn hasn't even appeared yet at the scene. He was supposed to reach first. Did this killer teleported at that beach? I just hope that Thorkell will learn now about Thors' death. 1) Thorfinn is injured. May have to rest. Although that confirms Canute being the one orchestrating the whole thing, having the Jomsvikings kill each other. Which may or may not be a good idea in the long run since he is killing off a strong army that he often employs but since the Jomsvikings are mercenaries-for-hire and not part of his army there is no guarantee either they won't switch their loyalties to another king with a bigger purse. Thorkell being Thorkell is always awesome of course so I didn't mind this chapter. I'm guessing Yukimura is still thinking how exactly this arc should play out so he's dragging out just a bit. Edited by Red Haired Shanks, 25 June 2017 - 11:07 AM. Thorkell's second in command is hilarious. and the moment that pipsqueak started challenging Thorkell, he goes like "Kill him!!" Well his whole crew knew where this was going. This young generation cracks Thorkell up. Everyone is so energetic! Except Thorfinn. 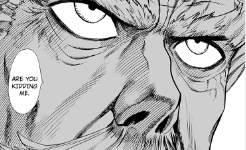 "I hope you can entertain me old man"
What a phrase to say to Thorkell?! or acknowledges it. The guy was almost in another universe. see that pipsqueak dying either though. It's nice we can't predict the outcome. Edited by Red Haired Shanks, 26 June 2017 - 04:47 AM. You'd better not to be kidding me! Edited by Jekkusormi, 19 March 2018 - 02:35 PM. Wow, did not expect this series to get an anime adaptation. Going to be very interesting to see how this turns out. Wonder if this means the series is coming to an end soon if they finally want to adapt it? Something tells me they are just gonna adapt the first part of the series but I'm stoked either way. @Shin I'd be extremely disappointed if the series were to end soon since they haven't even obtained the funds for their voyage to Vinland. Most likely, the anime will just cover what they can from the manga and maybe go on their own or wait until the author has released enough material for more seasons. Part 1 and the Slave arc can be adapted just fine. But the manga still has way to go, they're not even close to Byzanz yet, let alone Vinland... in the opposite direction >_>. Edited by Oben, 24 March 2018 - 09:47 AM. It's done! The Baltic Sea War is done! Hope we can get to Miklagard soon.